This young woman was missing one front tooth. Dr. Amin replaced it with a dental implant about five years ago. Because the tooth was absent for a few years, the bone had shrunk. A bone graft was done to replace the lost bone. This 25-year-old male had his teeth ground down for a bridge. The bridge broke and he wanted to have separate nice teeth again. One dental implant and two ceramic crowns were made in our office in Burbank. One missing side tooth replaced with a dental implant. Root canal teeth are very prone to fracture. When they fracture they often need to be extracted. This pt form Glendale had an immediate dental implant to replace the broken tooth. My patient from Burbank had a dead, yellow front tooth. 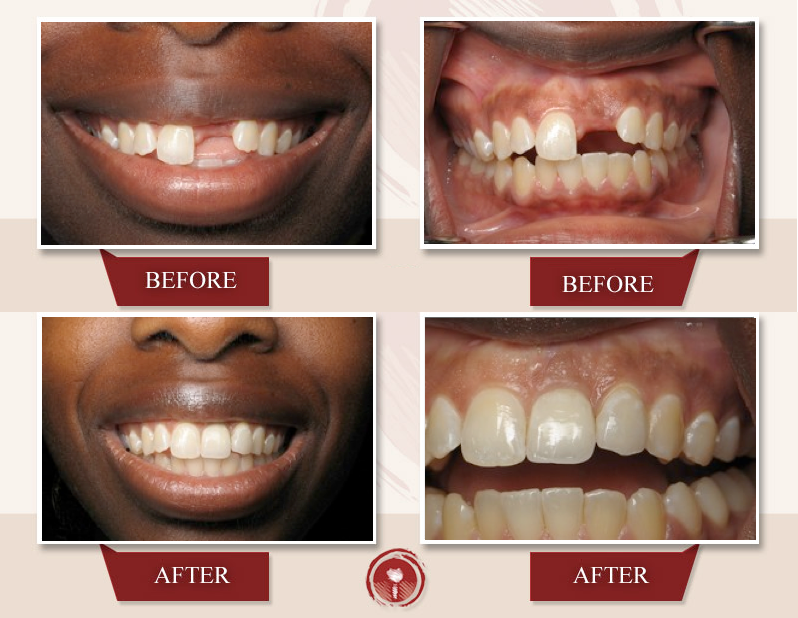 The tooth was extracted and a same day immediate implant was placed. The final tooth looks straight and the gum line is perfectly shaped!